Only pastors are to publicly preach, teach, and administer the Sacraments. They have the proper vocation and call to do so. The Office of the Public Ministry is given to them. Laymen are to confess, not preach. Laity are to share the Gospel when we have opportunity and cause. We need not make grand apologetic defenses. It is enough to simply confess the hope that is in you. After all, a child’s simple confession is often far more powerful than even the most eloquent defender of the faith. Still, it is good for your own knowledge and spiritual formation to learn about apologetics and be able to provide a defense or at least point to a person who can. Delighting in God’s Word is after all commanded of the Christian (Psalm 119). Studying God’s Word grows faith and understanding. A well-catechized laity is a great defense against heresy and Satan. That said, the pastor should be the first and best line of defense for his flock. It is his vocation to defend the faith to others for the laity and to be a resource to which the laity can flee if they find that they are out of their spiritual depth. Within the Church in a public setting only the pastor is to preach and teach. He is called to do so. He stands in the stead of Christ. He has the theological training to preach and discern the Word rightly. He is the shepherd of the flock, the laity. The sheep do not lead the herd but rather the under-shepherd of Christ is to do so, in the stead and by the command of Christ. After all, we do not intentionally let people untrained in medicine perform surgeries, nor do we intentionally let those who are ignorant of the law be lawyers. So it is with something even more weighty, the soul: those who are qualified and recognized do the work they are called to. This is both to ensure that the pastors are well-trained, in accord with Scripture, but also that the flock knows who the true shepherds are from the wolves who wish to devour them. We are all priests, but we are not all ministers. Lay ministers are not a thing. There are only pastors and laymen. These are both godly vocations given by the Lord, and we should delight in both (1 Corinthians 4, 1 Corinthians 12:12-31). With this distinction between laity and ministers in mind, what is a rightly ordered call to the ministry? It starts with Ordination, which is given by the laying on of hands of other pastors in the presence and with the consent of the laity. It is a public recognition by the Church that the man being ordained is called by God to the ministry. Apostolic succession, while nice, is not required. Ordination is the gift of God to the Church. In the case where a pastor cannot be found to ordain another pastor, a Church may ordain one of its own (Acts 6:1-7, 1 Timothy 4:5-16, 1 Timothy 5:17-25, Titus 1:5-16). The call of the pastor is divine; however, the location of the call may change. In previous times bishops would move pastors around as and where needed. These days we rely on the call process to do so. There is no hard and fast procedure given by Scripture as to how to place a pastor. Instead, Scripture says that it should be done publicly and in good order after much prayer (1 Corinthians 14:26-40). Regardless of where a pastor finds himself or how he gets there, he has a call to be there. He is placed there by God for the good of the congregation. The Confutation agrees with this article but demands that bishops do the ordaining, following established canon law. Melancthon responds thusly. 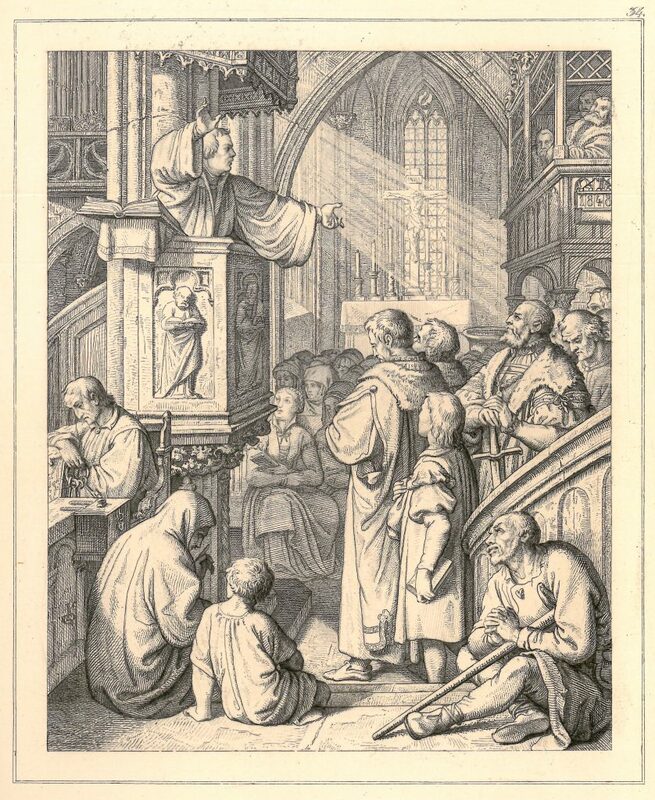 24] The Fourteenth Article, in which we say that in the Church the administration of the Sacraments and Word ought to be allowed no one unless he be rightly called, they receive, but with the proviso that we employ canonical ordination. Concerning this subject we have frequently testified in this assembly that it is our greatest wish to maintain church-polity and the grades in the Church [old church-regulations and the government of bishops], even though they have been made by human authority [provided the bishops allow our doctrine and receive our priests]. For we know that church discipline was instituted by the Fathers, in the manner laid down in the ancient canons, with a good and useful intention. 25] But the bishops either compel our priests to reject and condemn this kind of doctrine which we have confessed, or, by a new and unheard-of cruelty, they put to death the poor innocent men. These causes hinder our priests from acknowledging such bishops. Thus the cruelty of the bishops is the reason why the canonical government, which we greatly desired to maintain, is in some places dissolved. Let them see to it how they will give an account to God for dispersing 26] the Church. In this matter our consciences are not in danger, because since we know that our Confession is true, godly, and catholic, we ought not to approve the cruelty of those who persecute this doctrine. 27] And we know that the Church is among those who teach the Word of God aright, and administer the Sacraments aright, and not with those who not only by their edicts endeavor to efface God’s Word, but also put to death those who teach what is right and true; 28] towards whom, even though they do something contrary to the canons, yet the very canons are milder. Furthermore, we wish here again to testify that we will gladly maintain ecclesiastical and canonical government, provided the bishops only cease to rage against our Churches. This our desire will clear us both before God and among all nations to all posterity from the imputation against us that the authority of the bishops is being undermined, when men read and hear that, although protesting against the unrighteous cruelty of the bishops, we could not obtain justice. Sufficiently foster outward-looking in-person gatherings.